The back can be removed as your child reaches maximum height and weight. For every parent, safety in the car is always number one. With the unpredictability of the road and other motorists, parents want the peace of mind of knowing that whenever they travel or wherever they travel their child is going to be safe. The best way to guarantee that safety is to have a car seat that is durable and secure. Diono has made the Monterey XT High Back Booster Seat and it has several features that grow with your child that allow this particular seat to keep your child safe as they get older. The seat is fully adjustable and versatile as it can either be a backless booster seat or a high back booster. Whichever way you choose to use the seat it will protect your child. The Diono Monterey High Back Booster Seat is designed to grow with your child. The headrest is fully adjustable and has several heights in order to adjust to the height of your child. The sides of the headrest can also be adjusted to fit securely to your child’s head so they can rest their head to sleep or it can be widened so that they have room to be comfortable. The sides of the booster seat also adjust and can be expanded as your child’s body expands. The entire seat is filled with EPS foam, which absorbs shock easily. There are two retractable cup holders on either side that are used for either water bottles, cups, or snacks. The back of the booster can be unhinged from the bottom seat portion and stored for future use. The entire seat is connected to your car by a latch system where the seat clicks into the backseat and is easily adjusted and tightened by pulling on two straps in the front. The seat can also be folded down so that it can be removed from the car or traveled with or transferred to another vehicle. The cover is also machine washable should you need to remove the cover and wash it. It may be easier to spot clean the seat as taking the cover on and off can be difficult to maneuver. The Diono Monterey High Back Booster Seat is the epitome of safety. Because it can be adjusted in so many different ways, your child is protected as they grow. The only time your child will grow out of the seat is when they no longer need a booster and can use a regular seatbelt without the aid of a booster. The EPS foam that fills the seat absorbs shock at a high level so in the event of a fender bender or accident, the foam will take the impact of the collision and your child will remain safe. The latching system that is available to the seat keeps the seat clipped securely to the car and will prevent the seat from accidentally coming loose or sliding off the backseat. This not only helps keep your child safe and in place, but if your child is not in the seat and you make a sudden stop, the seat will remain in place and not become a projectile potentially hurting anyone else in the car. The headrest of the Diono Monterey XT High Back Booster Seat has eleven different adjustments. The first adjustment is the height of the headrest. Behind the back of the headrest there is a red handle that is similar to a car door handle. When you cup your fingers under the handle and pull it up, the headrest will begin to rise up to the level that matches the height of your child. As your child begins to grow and get taller, you can consistently raise the back of the headrest so that your child’s head is always supported when they are in the car. The other way that the headrest adjusts is on the sides. The sides of the headrest can be folded in so that the headrest can become tighter around your child’s head. It is reminiscent of the headrests found on airplane seats where you can maneuver them to be tighter so that you can sleep or have more support for your head. The headrest of the Diono Monterey XT Booster Seat does the same thing and this feature allows your child to be able to sleep soundly and comfortably while they are in the car. The back of the Diono Monterey High Back Booster Seat has a feature that most booster seats do not, and that feature is the adjustable backrest. The backrest of the seat has the ability to widen as your child’s shoulders get more broad with growth. On the back of the seat back, there is a red dial. When you turn the red dial to the right the shoulder areas of the seat will begin to widen to allow your child the ability to remain comfortable and safe as they grow. The sides of the backrest can widen as much as twenty inches so that even the biggest of kids can safely fit in the seat and be safe while they are traveling in the car. The backrest also has a reclining feature for when your child wants to get more comfortable. The seat has two different levels of reclining for your child. The backrest can also be detached from the bottom seat by exposing the hinge and pulling the two parts apart. Your child can then just use the booster seat and an ordinary seat belt when there is no back to the booster. Many parents only use the bottom booster seat for their older children. The bottom seat can be latched into the backseat of your car through the latch system. To latch the seat is quite easy. If you flip the seat upside down you will see the laches. Behind the front of the seat is a button that when pushed will give slack to the straps that the latches are attached to. You can extend the latches out of the back of the seat so that you have enough room to latch the hooks into the car seat hooks and secure the seat. Once the latches are hooked in, you can then pull the straps from the front of the seat as tight as possible and the seat won’t move. When your child is sitting in the seat without the back, the seatbelt crosses over them just as it does when the back of the seat is attached giving your child the safety they need to travel with the utmost care. The bottom seat of the Diono Monterey XT High Back Booster Seat comes with two retractable cup holders. The cupholders are hidden underneath the sides of the seat, but you can pull them open and they swing open on a hinge. The cupholders’ location on the seat puts everything your child needs within reach. The holders are big enough to hold water bottles or sippy cups, and the holders are also big enough to hold snacks. No matter how long the car ride your child will be able to have their food and drink at hand without distracting you while you drive. If there is no food or drink, the holder is also a great place for your child to put some of their smaller toys or stuffed animals. When you open the box of the Diono Monterey XT High Back Booster Seat, the seat comes in two parts. If you choose to use just the bottom seat then you are good to go. All you have to do is latch the seat into the car and your child can sit on it and go. If you want to also use the backrest, clicking the two pieces together is easy. All you have to do is open the flap of fabric in the back of the seat and expose the two hinges underneath. You can then take the backrest and slide it into the hinges as there will be two clips on the bottom of the backrest. The clips and the hinges will then slide together and click securing the backrest to the booster seat. Push the backrest forward to fully click it in. The extra fabric can be tucked underneath the backrest fabric giving it a smooth look. The seat can continue to fold in half so that you can easily remove the seat from the car and travel with it anywhere. The Diono Monterey XT Booster Seat is designed for children of a certain age range. The seat is a forward facing seat so it is not meant for newborns or any child that requires a full car seat. The Diono Monterey XT is designed for children who are forty pounds to 120 pounds and 3’2” to 5’3”. With a range this wide, your child will be protected for many years in this booster seat. After a certain age, it is common sense that your child will no longer need the booster seat as they will become too heavy or they will reach an age where it is no longer appropriate to be in a booster. It’s usually around the age of 12-years-old that many parents deem their child too old to be in a car seat even if they are still under 5’3” and under 120 pounds. The Diono Monterey XT High Back Booster Seat has a removable cover that is safe to put in the washing machine. It is recommended that you spot clean the seat as necessary because taking off the cover is difficult as is putting the cover back on. The seat comes in the box with the cover on, which means that the cover has been perfectly fitted by the manufacturer. There is no guarantee that the cover will go back on in the same way. With that said, by spot cleaning using ordinary fabric cleaners and sprays you will find it a better alternative then dismantling everything to put the cover into the washing machine. Since your child will be older and a bit less clumsy, the chances of spills is reduced or the spills will be smaller, so spot cleaning it is the smarter choice. 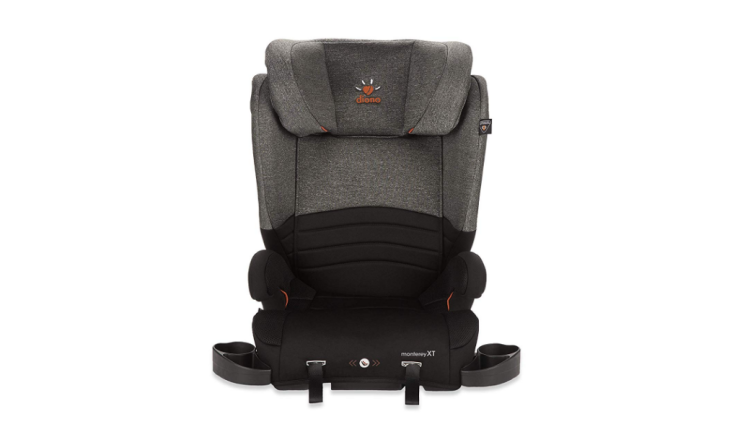 The Diono Monterey XT High Back Booster Seat is reasonably priced because not only is the price not too high but the amount of time that you will own the seat could last a very long time. The seat is ultra safe and with a mid-range price tag, the seat fits into anyone’s budget. With the amount of years that you will have the seat it comes down to a small amount of money per year that you are investing into your child’s safety. The Diono Monterey XT is definitely worth the price. The Diono Monterey High Back Booster Seat is one of the most affordable booster seats for the amount of safety it provides. The booster seat can accommodate the growth spurts and body changes of your child while continuing to keep them safe. You can buy one car seat and potentially keep the seat until your child is almost a teenager. It is easy to clean, easy to latch, and offer a high level of safety and peace of mind. Many parents are very impressed by the durable fabric and color scheme of the seat, which adds to its popularity. If you need to buy a booster seat, the Diono Monterey XT High Back Booster Seat is a great choice to keep your child safe, to fit into your budget, and easy to maintain and keep for years to come. For the price and the high level of safety, the Diono Monterey XT is a wise purchase.